6 Elements of Social Justice Ed. : I Like Me! 6 Elements of Social Justice Ed. Below is an annotated list of children's literature for the elementary classroom. The books are organized by the Six Elements of Social Justice Curriculum Design (Picower, 2007). It is based on work by pre-service teachers at Montclair State University. They have read and reviewed these books and provided insights into how they can be used in K-5 settings. Like this book? Buy it here! 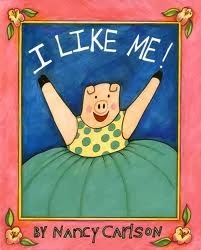 Summary: This book focuses on what the main character, the pig, likes about herself. She describes various activities that she enjoys, physical features, daily routines, and addresses self-esteem issues that she might have. She finds positive attributes about herself through the book that reinforces the notion that she loves herself just the way she is. Element 1: Self-love and Knowledge. This book pertains to Element 1 because it helps children pick out certain things about themselves and take pride in it. A child may realize that he/she has darker skin than his/her friends and this physical quality may be a way for the child to express that they like having darker skin. This book could lead into a conversation about what their heritage is, where they come from, their culture, etc. It will allow students to have a sense of pride about who they are and find positive attributes that could help with their self-esteem. Activity: To use this book in the classroom, you can reference the Resources link for an activity to do with the students. This book can also be read aloud to the entire class and they can discuss various things about themselves that they have pride in. The students can draw pictures of themselves and explain to the class what they like about themselves. What I Like About Me!